To celebrate the agricultural richness of the region, the Stockton region offers numerous farmers' markets that bring the farm to your table as soon as the produce is picked. Even better, many farmers' markets are open year-round so that locals and visitors can get fresh food any time of the year. 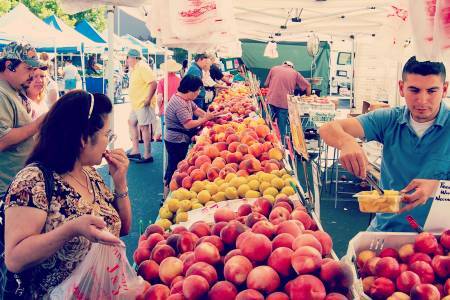 Who doesn’t love an early Saturday morning stroll through a farmers' market? One of the oldest farmers' markets in the state, the Downtown Stockton Asian Farmers' Market is held year-round on Saturday from 5:30 am to 11 am, throughout the year, and draws hundreds, if not thousands from around the region. In addition to fresh fruits and vegetables, the market also offers Asian produce, products, seafood, and sweets. The amazing assortment of items landed this market on Saveur magazine's Top 100 in 2007! Located in the Trinity Parkway, Park West Shopping Center, right off of I-5 and Eight Mile Road next to Lowe's and Sonics. The market is held Sundays May through October from 9am to 2pm. The market offers a diverse selection of ready-to-eat treats, and a variety of seasonal produce and a few gourmet food trucks. This fairly new farmers' market held Wednesdays May through October from 9am to 2pm in the Swenson parking lot, in conjunction with the Stockton Certified Farmers Market Association. The Farmers' Market at Swenson is open rain or shine, and aims to keep Swenson Park Golf Course thriving with new visitors in the area. Add fresh flavors with a stop at the a San Joaquin Certified Farmers Market, held Thursdays, May through November from 8am to 1pm (behind Weberstown Mall). The market features a variety of fresh produce and fresh baked goods! BONUS: Residents can enjoy in season produce year-round at the same location every Sundays from 8am to 1pm! The Downtown Tracy Farmers' Market held year-round on Saturday gives locals and visitors the chance to not only stock up on fresh produce but also local favorites from bakeries like Beckmann's Old World Bakery and Kandi's Pies and Pastries. The Lodi Farmers' Market held Thursdays May through September is reminiscent of the street fairs that pepper San Francisco, thanks to the music and booths that intersperse a selection of vendors selling everything from locally made sausages to clothing. Other local markets that attract both locals and passersby are the Market at Delta College, San Joaquin County Fairgrounds Flea Market and Stockton Open Air Mall Wilson Way Flea Market, each with its own specialty and plenty of fresh offerings. Enjoy the fresh produce and time spent with family and friends at your next visit to a farmers' market! Be sure to check out the San Joaquin County Farm Guide and Map for a list of farms and u-pick ranches, and further details to help you plan your trip. Still have more questions? You can message us 7 days a week for assistance on shopping, dining, and things to do in Stockton.